Stampin' Up! must have read my mind with all the great coffee sentiments in the Holiday Mini especially the Merry Cafe stamp set. I know they are going to be a hit with my customers at the Coffee Shop. Thank you Stampin' Up! I started with the coffee cup and sponged on some Fossilized Amber Distress Oxide Ink. I love how it came out along with the leaves. 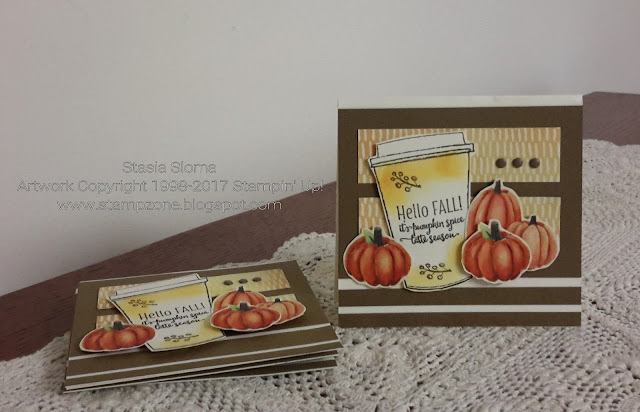 The pumpkins I cut out and layered from the Painted Autumn stamp set. The rest was layers of Soft Suede and designer series paper. Love the end result.